Every woman has a story like a thread pulling, twisting and curving through a tapestry coming together to form a masterpiece for the eye to see. The women at the Healing Hands of Joy Centre (http://www.healinghandsofjoy.com/) in Makale, Ethiopia, who have recovered from obstetric fistula (find out more at this website: http://www.fistulafoundation.org/whatisfistula/faqs.html) , have a tapestry that has many pulling threads and the eye can see the pain they have lived through. But looking beyond that the colours are startling and full of joy and enthusiasm. The stories of these women, seen in their deep and captivating gaze, are heart wrenching but at the same time overflowing with joy. The enthusiasm of these women to go back to their villages as Safe Motherhood Ambassadors to inform other women about how to have safe deliveries and to break cultural stigmas against women with obstetric fistula. These women stay at the HHOJ centre for 1 month where they are taught maternal health skills and nutrition as well as literacy and communication skills. They also have psychological counseling available for them. In the photo above the women are showing their art work they produced during one of their art therapy courses. For most of them it was their first time to draw and do art and were quite talented considering. The focus on their faces as they hunched over their paper and drew their hearts out was so childlike and beautiful. 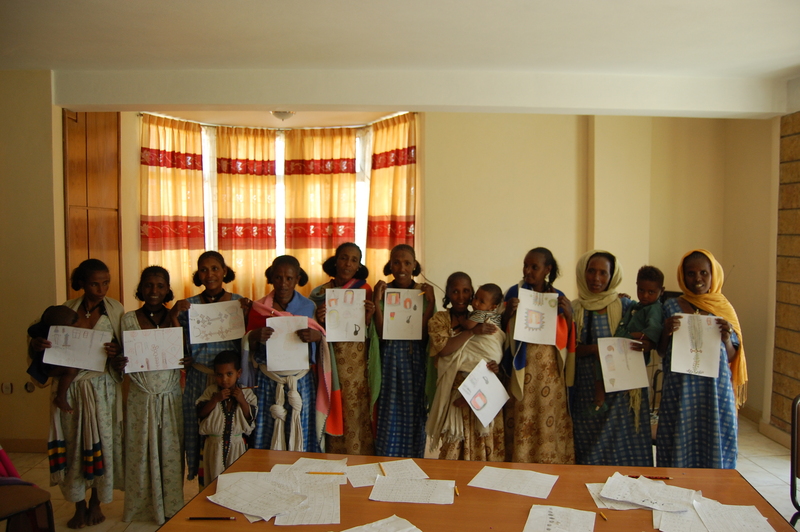 Most of them were drawing traditional Ethiopian dresses and crosses and others coffee pots and shade trees. It really was beautiful to see. I then began to listen to each woman, with the help of an interpretor, as they poured out their stories. The average age of these women were married at was 15 and the average age they had their first child was 16. One woman’s marriage was actually pre-arranged while she was still in her mother’s womb. Then at the age of 6 she was engaged to this man or let me say boy and then 6 years later they were married. When she found out she had developed obstretic fistula when she was 14 her husband divorced her immediately, which is the case for many women. In Ethiopia this is a frequent occurrence due to deep cultural and religious beliefs that women have been cursed from evil spirits. Women can be shunned from their communities from 5 years to as long as 20 years in isolation. Also for women to be transported from a remote village to a hospital to give birth being carried as a woman is culturally not acceptable. Less than 6 in 10 women in developing countries give birth with any trained professional, such as a midwife or a doctor; and when complications occur which is about 15% of all births there is no one available to treat them. One of the main causes of fistula, which is entirely preventable and treatable with the proper facilities and care, is poverty and the low status of women. The beautiful thing about the Healing Hands of Joy Centre, which is the only one of its kind in the world, is that the women are able to heal and start their lives again. They are given a second chance, one that will empower them through gaining income-generating skills and purpose to their lives. As I listened to the women, the translator told me that they wanted me to share something with them. I was rather surprised by the question because what do I know about their situation or what kind of encouragement can I leave for them. So I spoke from my heart and told them how I see much light in them and courage and I have no doubt that when they finish at the Centre they will go back to their villages and empower other women and raise awareness and education about fistula. As I was sharing this message it came to my mind that today, December 8th, was the feast of the Immaculate Conception of Mary. It could not have been a more appropriate and beautiful feast to celebrate with these women who have suffered the loss of their children through childbirth and are here now recovering and healing from this pain and much more to start new. I shared this also with them which was immediately followed by three shriek-like bird calls which is the highest expression of joy here. I tried to imitate this shriek thing they did but only resulted in peels of laughter that filled the room. They shared with me their gratitude because for their lives to be acknowledged by someone does not happen often. For a foreigner to affirm their worth and their dignity was a real gift to them. I honestly did not give or share much but as I expressed in one of my previous posts to be truly present is worth much more than one thinks. I felt in that room not pain or sorrow but of an immensity of joy that could not be held in. Yes, the heart-wrenching stories of young lives lost and suffocated by cruel realities was ever present, but the hope seen in their eyes banished all darkness in sight.